Canada’s Andre De Grasse was able to shed more race rust in his 200-metre season debut on Friday, while fellow Canadian and relay teammate Aaron Brown continues to look in mid-season form. De Grasse finished sixth in the eight-man field in 20.46 seconds at the season-opening Diamond League in Doha, Qatar, one week after clocking 10.15 in the 100 at the Drake Relays in his first race since suffering a strained right hamstring nine months earlier ahead of the world track and field championships in London, England. De Grasse, 23, will focus on the 100 at the next Diamond League event on May 12 in Shanghai, China, where the Markham, Ont., runner will battle 22-year-old Christian Coleman of the United States, this year’s world indoor 60 champion. Brown, 25, was fourth on Friday in 20.18, matching his Commonwealth Games record semifinal time from last month in Gold Coast, Australia. The Toronto native crossed third in the final after clocking 20.34 but was upgraded to second and a silver medal when England’s Zharnel Hughes was disqualified for clipping the arm of Jereem Richards of Trinidad and Tobago. 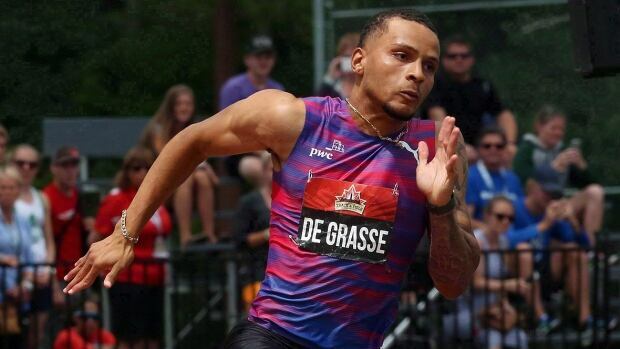 Similar to the Drake Relays, De Grasse wasn’t in top shape since he last competed in the 200 last July at a Diamond League meet in Rabat, Morocco, which took place before his injury. “A lot of things could be in play here. He just competed a few days ago, and since he was off for so long, he may not be recovering from competition as quickly as usual. Plus his time of 20.46 is still an Olympic and world championship A standard,” said CBC Sports analyst Anson Henry. Noah Lyles, last year’s Diamond League champion, won Friday’s 200 in a personal-best 19.83 to break fellow American Ameer Webb’s meet record of 19.85, set on May 6, 2016. The 20-year-old Lyles has won all three of his Diamond League races. Last May in Shanghai, the native of Gainesville, Fla., ran a world-leading 19.90 and returned from injury to capture the circuit’s final event in Brussels in September. Richards, making his Diamond League debut, was second in a season-best 19.99 after running 20.12 to win Commonwealth Games gold last month. Reigning world 200 champion Ramil Guliyev rounded out the podium in Doha, placing third in a season-best 20.11. Caster Semenya’s quest for a title double in the Diamond League started well when she won the 1,500 metres in a South African record time on Friday. The two-time Olympic and three-time world champion in the 800 won the 1,500 comfortably by more than a second in 3:59.92, a world-leading and personal-best time. “It’s always a dream to set the national record and I want to continue to push beyond my personal best,” she said. “We definitely achieved that here. Semenya was racing for the first time since the International Association of Athletics Federations announced the introduction of new regulations, which take effect on Nov. 1, that limit the levels of natural testosterone allowed in the bodies of female athletes competing at distances from 400 to 1,500 metres. She has been accused by some of having an unfair advantage due to her higher levels of testosterone. Kenya’s Nelly Jepkosgei was second and set a PB in 4:00.99 while Ethiopia’s Habitam Alemu third (a season-best 4:01.41). Semenya came to Doha after her 800-1,500 double at the Commonwealth Games in Australia last month, and begins the defence of her 800 Diamond League title at the Prefontaine Classic in Eugene, Ore., on May 26.